Mention innovation and many people think of big, revolutionary and transformational ideas. But most innovations – particularly in infrastructure projects – don’t come about in that way. Innovation is more likely to be small ideas, well executed. Or it may be seeing how other industries do things and applying that understanding to specific infrastructure problems. Practical innovation is also the territory of business cases, reviews and methodical trials. It can also take time. So people who have the capacity to innovate must become engaged early in projects. 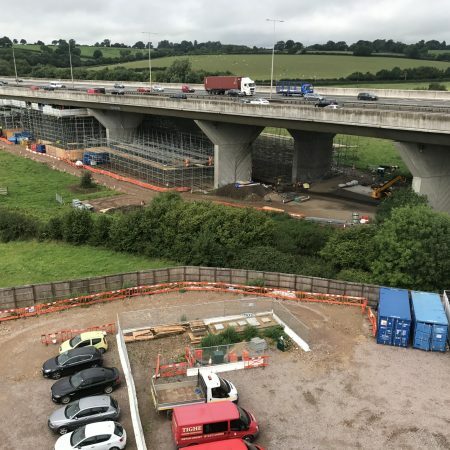 A few examples from our Gade Valley Viaduct project for Connect Plus and Highways England illustrate how innovations can be applied practically to deliver health and safety benefits, savings, quality improvements and reduced disruption for the travelling public. Specialist supply chain partners often work across different sectors. Their input can be invaluable for applying knowledge from other industries to bring added value to infrastructure projects. The Gade Valley project involves carrying out fatigue repairs to 8 No box girders across the eleven spans of the viaduct. As a consequence of the strengthening activities, there was a requirement to re-paint areas within the box girder, which is categorised as a confined space. The use of standard HAPAS approved solvent-based paint would have created significant risks of exposure to operatives and potentially create an explosion environment that would need to be mitigated. Our specialist supply chain identified a solvent-free coating which had previously been which would mitigate some of the risks to the structure and personnel over traditional coating systems. We are currently using the product under a departure from the standard at Gade, whilst it undergoes testing for HAPAS certification. If testing is successful, the product will be available to use as a standard product under the specification for highway works. The use of solvent-free paint has realised savings of around £2.5m. Part of the Gade Valley Viaduct structure spans the east coast mainline railway making access problematic, particularly when applying protective coatings. To efficiently utilise the limited time available and minimise disruption to rail users the team proposed a single coat application. This departure from the multi-coat application normally used on highways projects will reduce the planned abnormal possessions from at least four to one. Fatigue issues with the bottom flange stiffener fillet welds within the box girders required a solution to improve their design life. Various methods were trialled, which ultimately resulted in adopting a plasma weld dressing approach. Having fabricated a mock-up section of a box girder, we demonstrated plasma dressing exceeded all other methods for fatigue improvement with regards to health and safety, quality and production. By adopting techniques from the automotive industry, we utilised an automatic track-mounted device, coupled with features that would cut off the equipment should the dressing be carried out beyond the parameters of the specification. By using this technique, we were able to carry out the work without the requirement for lane closures and night work. In a similar way, Osborne trialled using a high modulus joint material (Irontech) as part of an asphaltic plug joint at Junction 23 of the M25. The material is cold applied. There are no hot works and only basic equipment is needed. The product also has a better lifespan. Other innovations we have implemented include a flushable sub-surface drainage system for plug joints. This stops them becoming blocked, leading to advanced degradation of the joint and surfacing. There are fewer unplanned maintenance interventions as a result. Because innovation is part of how we work it would be impossible to list all of them here. We could talk about powering our remote site office with solar panels to reduce diesel use and CO2 emissions. Or the mobile scaffold platform we have developed to minimise disruption and traffic management for overhead repairs. But what possibly matters more are the innovations still to come. These will happen because we have the right culture, processes and partnerships in place to identify and execute them.